Post-metal, a dirty word in knowing circles, can and should be applied to Gorguts‘ classic Obscura. Post-metal is an offshoot of post-modernism, a school of thought that attempts to reject overarching structural meaning and belief in greater narratives. To the post-modern mind, existence and experience consist of pluralities, splintered into fiercely individualistic cells prone to subjective rule, and inimical to any attempt at establishing a universal system of knowledge. Under this philosophy, adherence to a common-law guidebook serving as a framework for value judgments would amount to giving tacit approval to an authoritarian scheme of things. The post-modern mind rebels against the idea of linear progress and containing edges. Instead it chooses to break free of tradition and to chase the open-ended horizon, giving wing to its often reactionary attitudes; in fact, it can be said that post-modernism, as an approach to inspecting knowledge and the various forms it finds expression in, exists only to uproot convention. It seems to lack a defining purpose of its own, mired as it is in its perpetual obsession to bring down pre-existing ideological superstructures. However, in the absence of a time-honoured, governing set of principles, can ambiguity be far away? Can a severing with tradition with no motive other than just the severing and that alone ever have an impact beyond the momentary fascination that novelty engenders? A need to improve on boxed-in ideas is natural but is doing so by gleefully discarding much of what goes into the making of the original idea any improvement at all? The original idea, as metal goes, is as much structural as it is ideological. There are a few qualities that are common to how all true metal should be constructed. Melodic contiguity: All forms of metal, even the harshest strains, are inherently and recognizably melodic in nature. This means that the individual phrases that make up a metal song obey cohesiveness, as tenuous as it may seem at times. Though individual phrases are often in different keys, it is paramount that they share the same musical space. Movement towards a discernible and logical conclusion: This is the will to motion previously outlined in these pages. Metal’s roots in traditional story-telling with a beginning, a middle, and an end, are not to be forgotten in eager exchange of a need to experiment. There has to be a gradual ascent, or a plummet as it were, towards an ultimate punctuation. Though various approaches can be used towards achieving this, playing for time in false hope of creating mood, while using ideas containing little intrinsic worth, is anathema to metal. 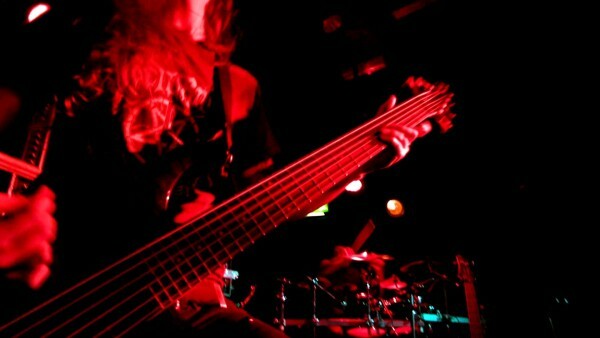 Rhythm section to assume a strong yet only supporting role: Metal is a predominantly lead-melody oriented form of music. Bass and drums are integral to creating a fuller sound but should only be viewed as swells on an ocean on top of which riffs and songs float. Often, swells rise and raise their load with them, but this hierarchy in relations is crucial and is to be preserved. Atmosphere created not through textural embellishments and quirks but as a by product of composition: All claim to that shady word “atmosphere” should come from immanent qualities in the way the music is written. Metal does not need overt experimentation with harmonics or tone if these asides are incapable of holding together on isolated inspection. Awareness that all forms of groove play to a far baser inclination in the mind’s analytical apparatus. They can be enjoyed on a case-by-case basis but are not something to be eagerly sought out or encouraged in metal. A keen comprehension of repetition as device: Repetition is to be used as steadily outward-growing eddies that take a song to a different place, yes, but one that maintains a tangible relation to the place left behind. Individual components within the repeating phrase should have some emotional consonance and not serve as mere padding. Conscious realization that metal is in fact composed music and not free jazz. How does Obscura, universally regarded as Gorguts‘ creative zenith, fare in context with these? On an individual song basis and on an album-wide scale, Obscura flouts more than a few of these observations. Obscura‘s sound is a swirling melange of dissonant tones under cyclic orientation, created on a wildly giddy bedrock of percussion. Conventional melody is used not as the driving force behind the songs heard on this album, but as ballast to the band’s almost painful need to expand the template of extreme metal prevalent till then. Guitarists coax unnatural sounds out of their instruments, resembling those made by scurrying creatures of the night, and mold them into a form of strange melody not without appeal, but on honest reflection little more than an outlier gimmick. While not all associations with the band’s previous classic Erosion Of Sanity have been severed, Obscura greatly favours repetition of its themes, themes that at times fail to register as true motifs, often to the point of tedium. Where the band’s younger work had irrepressible momentum on its side, they now seem stuck in a rut of their own making with no clear vision of how to extract themselves from it. Songs regularly lapse into the kind of navel-gazing that is so aggravating in modern technical bands, in hindsight obviously influenced by this album. The most obvious example of this would be ‘Clouded‘, an idea that would be deemed insufficient even for the most basic of interludes but here stretched beyond all limits of endurance. It would be disingenuous to suggest that Obscura detonates the core of music entirely, contrary to epithets of “chaotic” and “cacophonous” regularly appended to its descriptions. There is a kind of twisted logic to these songs but it is so far removed from what has gone before in the metal canon that it barely, if at all, qualifies as metal. Perhaps the album’s greatest failing as a purportedly metal album is in the lack of a human aspect. One would have to project really hard to glean any kind of meaningful emotion from these songs, uniformly monochromatic, mechanized, and without hope, or rage, as they are. In its abundant jagged outcroppings and in its constant search for the next unorthodox detour, Obscura shortchanges the simple truth that holds up metal and indeed all “essential” music, that of relating an idea through sound. What essence, then, does Obscura have to relate? To make meaningful commentary on a band like Vexilla Regis Prodeunt Inferni, or any other band walking the old death metal tightrope for that matter, one has to hear them in context with the specific niche in time that their sound occupies. Execute a bit of nifty time-travel in the mind and place the band concerned in the august company that it aspires to keep. Observe if it compares favourably with at least the spirit of the originals in terms of aspects like general coherency in songwriting, perpetual will to forward motion, and, above all else, that ineffable, visceral reaction that only the very best are capable of evoking. Originality in this cloistered paradigm is a disingenuous word; what the avid listener hopes for is a transmission of the same vitality that informed the heyday of this music. Vexilla Regis Prodeunt Inferni posits no claim to innovation but that is no crime in itself. Incantation, the bread n’ butter of modern death metal, is frequently referenced in the use of flowing tremolo lines plucked from the chromatic scale. While there is nothing inherently wrong with the use of atonality in death metal – it indeed comprises much of the bedrock of the genre – it also becomes something of a cop-out in the hands of lazy bands that lack the creativity required to compose tastefully and in accordance with tradition. 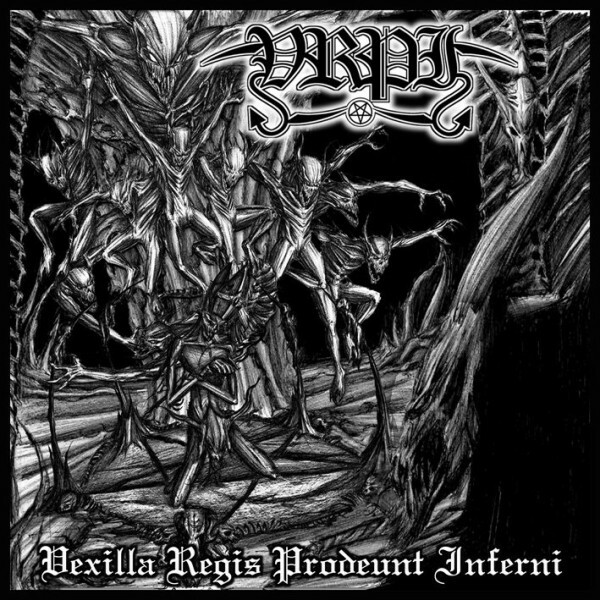 Vexilla Regis Prodeunt Inferni aren’t an especially lazy band and are perfectly capable of constructing riffs according to harmonic conventions as heard in the more black metal-inspired sections of this album. 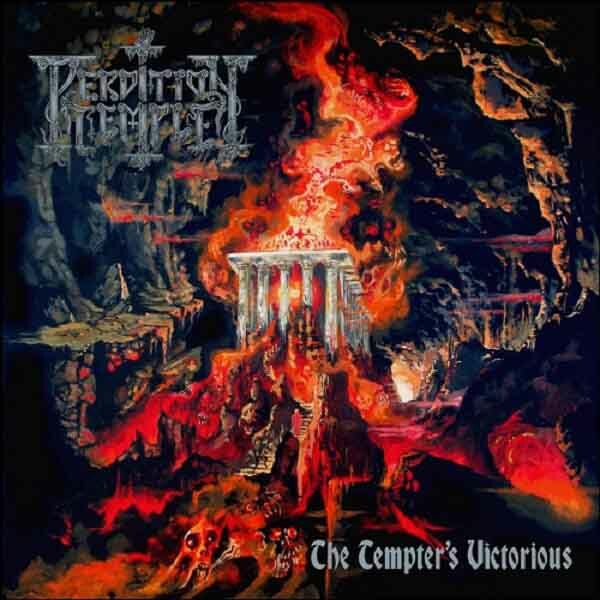 Perdition Temple’s sophomore album is one of riffs written and dispersed as discrete packages. These are sewn together into short, explosive bundles extremely dense in content but not always boasting the smoothest of transitions. Often the tonal shift between adjoining bars is far too drastic to convey any sense of uniform texture, giving the impression of an album constructed from a granular, low-level perspective rather than a more holistic, top-down approach. Meaning that the band came up with a whole bunch of riffs first, before cobbling them together into songs. Performed at near-always breakneck speed, songs pass by in a whirlwind of intense activity that isn’t always easy to discern. This is blistering and warring death metal displaying none of the stalling tactics practiced by modern death metal bands, and for that much it deserves credit. There is interesting micro-play within individual parts but the whole doesn’t foster or even attempt to put much store in memorability. The addition of Bill Taylor as guitar foil has given Gene Palubicki free rein to indulge himself as he never had chance to on past efforts in Angelcorpse or even the Perdition Temple debut. The role of rhythm is sometimes completely dispensed with, the two guitars intertwining like Hermes’ serpents about a support of hyperactive drumming, sniping and spitting out angular phrases that, in surface aspect, wouldn’t be unseemly on a tech-death album. But this act’s pedigree being firmly rooted in death metal, the constant barrage of information never loses its essence of violence. A return to themes familiar from older works, primarily through the use of groove as introductory and relaxation device, is in greater evidence during the second half of the album. As always, incendiary solos faithfully modeled after Trey Azagthoth find space on a Palubicki album. Azagthoth’s best work was unparalleled, however, because it was the original extension of its creator’s will and personality, much like the eternal consciousness standing outside of time and space, before the birth of time and space, that Eastern monism proposes, willing all creation into existence from within itself. Palubicki’s solos are the finest replicas of Trey Azagthoth that death metal has seen but ultimately they fall on, and should be judged by, the sword of rote inspiration that created them in the first place. Riot founder and guitarist Mark Reale died in 2012 after releasing the consistently engaging Immortal Soul. Under-appreciated for their entire careers, Riot never quite managed to do as well as they should have in the underground credibility sweepstakes. Manilla Road and Virgin Steele have both acquired formidable reputations with the passing of time, and deservedly so too, but Riot has been relegated to a footnote in metal history for the most part. Like W.A.S.P. and early Manilla Road, Riot spent the early years as a fun-loving hard rock band teetering on the edges of heavy metal, without compromising their knack for tasteful songwriting or acute, insightful storytelling. Greater musical awareness dawned with the classic Thundersteel, no doubt influenced by the heavier, more intense developments in the contemporary metal of the time. Their run since then till the present day contains many undiscovered gems sure to appeal to all lovers of classic heavy metal. How does one judge an album like Unleash The Fire? Created by those that have survived Reale’s death, and containing no original members, it is a tribute to a fallen comrade whose essence yet permeates all that is contained within it. As opposed to the more extreme strains of metal, everything in this music is geared towards a culmination in the big vocal chorus, new singer Todd Michael Hall recalling the late Guy Speranza’s clean, distilled tones. Riot’s talent, however, has always been to imbue this deterministic course of things with intensely melodic — but never melodramatic — embellishments and minute detours, thus greatly enhancing the overall fabric of songs. A wealth of detail lies hidden within the simplest of chord progressions, allowing the listener to enjoy the moment regardless of general predictability. Picking technique relies on tighter, speed metal chugging for creating and maintaining tension, and conventional, open power chords to convey a sense of epic release. Neoclassical virtuosity finds comfortable home amidst an undeniable individuality that is touched with the harmonic sensitivity of old practitioners like Blue Oyster Cult, Thin Lizzy, and Iron Maiden. Albums like this are the reason why it is possible to be optimistic for the future health of metal despite much evidence suggesting that the rot has already set from within. There is a naive, guileless innocence to be found here, refreshingly free of the cynicism that reduces the best among us to surly curmudgeons at times. 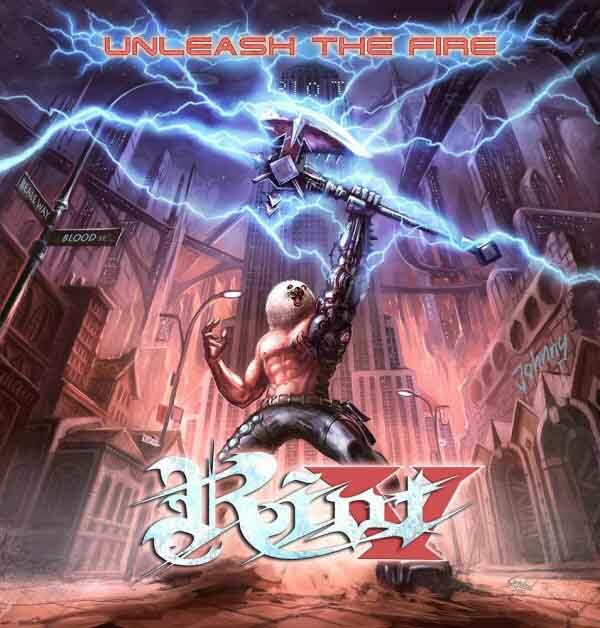 Unleash The Fire is a well spring of inspiration for all real strains of metal, as disparate as they may feel on the surface, if not always through its cosmetics then most definitely in what it aims to represent. In its spirit, the way forward for metal can be seen much more clearly, by opening the eye at the back of the head, and keeping steady sight of what has gone before. What may appear as anachronistic or overly sentimental are actually the eternal universals; honour, beauty, pride, a respect for the past and, above all else, the debt to oneself to live up to these notions in the best way possible. These ideas may seem to be out of vogue in a transitory world but that doesn’t make them singular; it only means that they lie buried under the detritus of sensory overload and cultural conditioning, most people being unable to detect them or give them sufficient credence, and, if they do, unwilling to act on them due to conflicting interests. Their embers, however, occupy a perpetually smoldering space in all human consciousness, waiting to be stoked into the fullest of fires. As long as this stays true, heavy metal will endure. The seed of Desecresy’s music contains a basal melodic notion or two, not without poignant appeal, which then comes to gradual bloom in an unhurried, self-assured manner. Songs on principle do not outstay their welcome but Desecresy’s approach towards writing revolves solely around realizing vehicles for this germ of an initial premise, in the process sublimating the interstitial stuff that goes into the making of a fully-fleshed, narrative piece. Flirting rarely with outright aggression, Desecresy prove adept at developing the elegant, bittersweet melodies typical of Finnish death metal, using a mid-tempo style reminiscent of Bolt Thrower, Vore, and Ominous Crucifix for these hooks to sink in. The result is an album curiously devoid of visceral thrills but one that will serve perfectly well as amicable background accompaniment. This is no slant against the band. Desecresy’s intentions are redoubtable but they could conceivably be making more resonant death metal if they gave away their Honour-Valor-Pride CDs and let their collective imaginations take flight. While the lack of variation in speed renders a sameness to much of Chasmic Transcendence, it is obvious that this is of the band’s volition. Desecresy choose to meander along this detourless path, confident in betting the house on the inherent quality of the melancholic nuggets they litter through the album; more than a few of these are thoughtfully crafted, and capable of launching songs on an altogether different trajectory in another band’s hands (see Creepmime or Deathevokation). Unfortunately, for Desecresy, the monotonous, simplistic nature of bridges linking these phrases — usually little more than a muted, open string or rambling, inconsequential power chords — makes these songs a game of waiting for the next cute part. This, of course, is a caveat of this particular style of droning death metal; the few good bands trawling these waters are able to create a consistent mood on an expansive, album-wide scale. 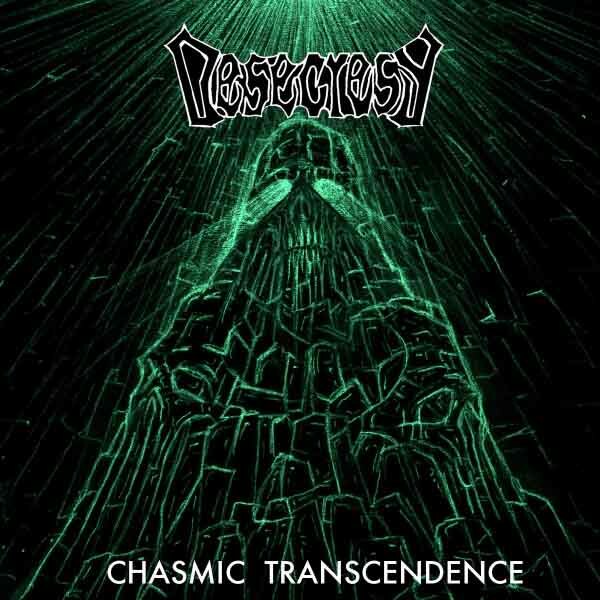 Desecresy can certainly not be accused of striking discordant notes in this respect; Chasmic Transcendence is a relatively seamless experience but that is a low bar to meet when the band’s sense of adventure clings so close to the ground.